Guinea pig food should always be fed with high quality, dust free hay and straw to provide your guinea pig with essential fibre, to reduce the risk of blockages and hairballs caused by a lack of digestible and indigestible fibre. Guinea pigs suffer from sensitive digestive systems and require a nutritionally balanced diet made up of three parts: hay, vegetables and a nutritionally balanced complete guinea pig food, such as a muesli mix or extruded guinea pig pellets that contain all the beneficial vitamins, minerals and fibre, that should be supplied to your pigs with fresh, clean, drinking water! Feeding the right balance of these food groups, will help your guinea pig maintain their immune and digestive systems, avoid upset stomachs and keep your guinea pigs healthy and active. Vegetables should be given to your pigs in moderation as cabbage for instance has been known to cause bloat, if fed by owners in large quantities, but please do not feed guinea pigs either rhubarb or potatoes as they are are poisonous if sprouted or green in colour. Adding fresh food to your guinea pigs diet will create interest and satisfy your pigs natural foraging instinct, whilst proving them with a source of natural vitamins which your piggies need to remain healthy, especially Vitamin C which guinea pigs can't produce themselves, so we suggest you feed vegetables like carrots, kale or broccoli in moderation. Owners that have both rabbits and guinea pigs, can feed them both using a complete rabbit food, but your guinea pig's diet must then be supplemented with fresh fruit and vegetables to ensure they are not deficient in vitamin c, as a lack of the essential vitamin can cause scurvy and lower your pigs resistance to diseases, so we suggest you feed a guinea pig food instead. You can also add multi vitamin drops to your guinea pigs food or drinking water to help supplement vitamin levels and promote good health that are also suitable for rabbits, chinchillas and ferrets. Unfortunately feeding your guinea pigs a bad diet that's, high in calories, low in essential vitamins and low in dietary fibre, can cause digestion problems, overgrown teeth, poor health and obesity. Consequently we recommend you supplement your guinea pig's food, with fresh vegetables in moderation and plenty of hay to help wear down teeth. 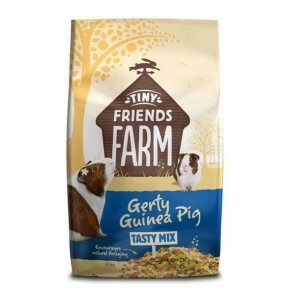 There are two main types of guinea pig food, extruded pellets that contain all the essential minerals and vitamins mixed together in bite sized pieces and complete guinea pig mixes that contain all the essential fibre, minerals and vitamins in a selection of different ingredients, such as cereals and flaked peas. 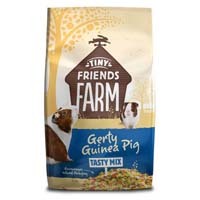 If your guinea pig is guilty of selectively eating the bits of a guinea pig food or muesli mix they fancy and rejecting the rest, even though the other ingredients are essential to maintain overall health, then a guinea pig food like Burgess Supa Guinea Pig Excel will be more suitable for your piggy and help avoid them missing out on vital nutrition! Guinea Pig Food: 5 stars out of 5 based on 0 user reviews.